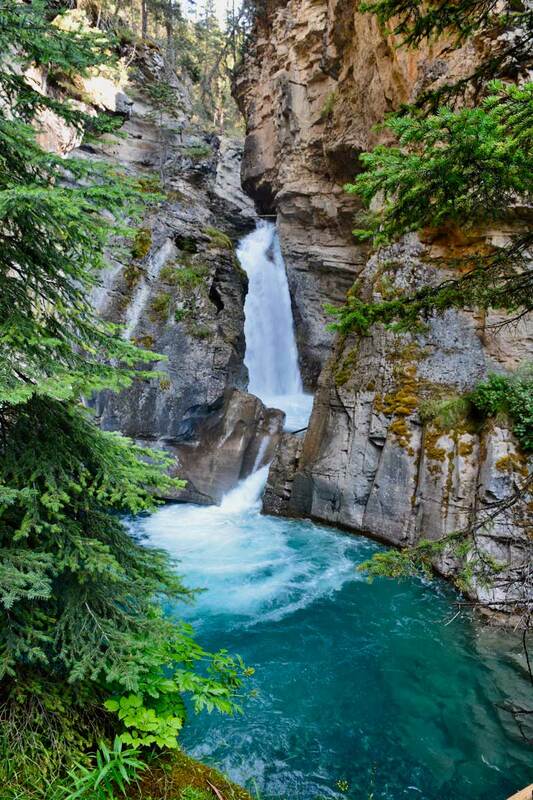 A definite must see natural attraction in Banff National Park. 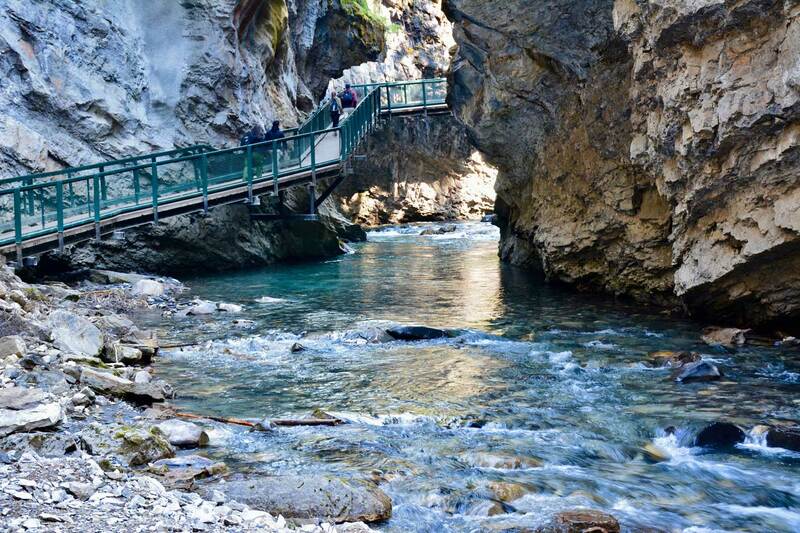 The hike/walk up Johnston Canyon is truly spectacular in any season and is the most popular hike in all of Canada. Why is it so popular? It has the greatest scenic value, multiple waterfall vistas and easy access over a relatively short distance. Regardless of your age or activity level, everyone can enjoy and experience the Canyon. It is recommended to hit the trailhead before 8 am or after 6 pm in the summer months as you will be rewarded with a much more intimate nature adventure. Peak hours do bring bus groups and large crowds of day visitors which changes the dynamic of the hike significantly. Not shocking, but the further that one hikes up the trail, the volume of visitors decreases. The trail head starts right at the Lodge and is a semi paved and fenced route. The trail ascends gently along the creekside/canyon edge and through forest where over the course of 2.75 km (1.5 miles) 7 dramatic waterfalls are presented along the self-guided hike. Catwalks and view platforms are suspended in the canyon walls, offering profound views of how the canyon was carved out of the smoothly polished limestone rock. The lower falls are a 20 minute walk or 1 km (1/2 mile) stroll where you will have an incredible view of the roaring falls from a bridge or enter a small cave for an even more intimate view. Careful taking camera gear into the cave as there is always heavy mist/moisture from rising waterfall spray. Here a variety of large pot holes are beautiful carved and polished from eons of glacial water erosion. From the lower falls to the upper falls is an additional 2 km (1 mile) or 45 minutes. 6 more waterfalls – most notably Stella Falls and Marguerite Falls present themselves. At Marguerite Falls you have two options; to go the lower viewing platform of the upper falls or proceed upwards to a higher view point. You really should experience both as they both offer spectacular views of the roaring cascading thunder. Again, heavy mist and spray at both locations particularly in the spring snow melt (run off ) which reaches a peak the 2nd week in June. It is most of the way to the lower falls – however there are catwalks that will only accommodate the width of the wheelchair so it is highly advisable to do this before 8 am on a summer day or after 7 pm before or after the crowds. This round trip will take you approximately 45 minutes and you will experience some beautiful vistas. Yes. The pet must be on leash at all times in Banff National Park (Fines can be quite expensive for an off leash pet violation). Make sure your dog is well behaved as there are many visitors with dogs also hiking. For the dog’s enjoyment and yours – an early start (7 – 8:30 am) is highly recommended. Bring doggy bags and for the love of mother nature… DO NOT leave them in the woods or on the trail, or behind a tree. Helpful hint: bring a large coffee cup with a lid and put the bag in that – secure the lid, pack it out and discard later at the garbage bins at the parking lot. The dogs will love all the forest smells and woodland creature noises. Please note there are very few if any places to allow the dog access to the creek water’s edge so bring a bottle of water and small container for them to hydrate. Sadly we have some tragic situations in the Park every summer with pets becoming seriously ill or dying because of heat exhaustion. How is trail in the winter and is it open? The trail is open all year round however once snow is on the trail, it is recommended to rent or buy snow cleats that attach to your shoes for better grip as the packed snow can be very slippery. Ski poles are also an asset. The waterfalls freeze over entirely and the massive ice formations clinging to the walls are magically spectacular. At times you can see the waterfall surging behind the enclosed sheets of encased ice. Not even Disney’s “Frozen” can compete with this ice magic. Keep in mind these trails are not patrolled at night so stay on the trail and time your hike to the available daylight. Is there a danger of bears on the trail? No. 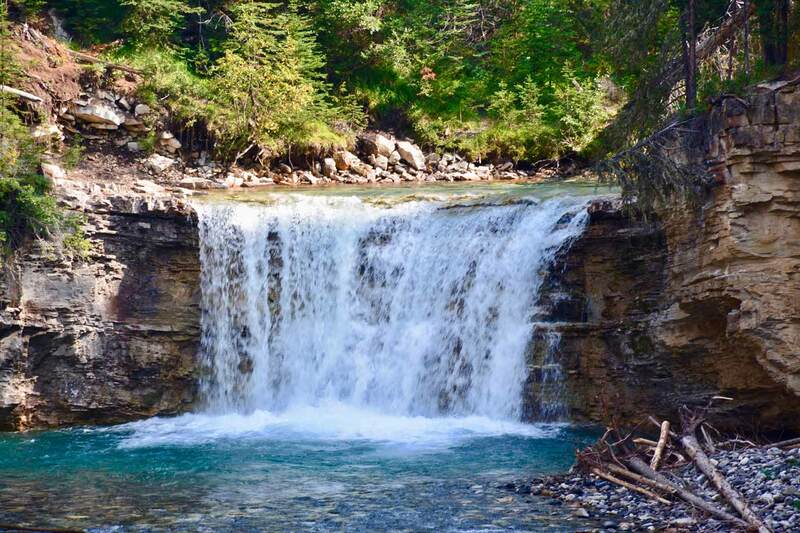 While the landscape surrounding Johnston Canyon hosts an immense amount of wildlife, the chance of experiencing any wildlife other than smaller woodland creatures is very very remote. Big Horn Sheep and Mountain Goats have been occasionally seen high up on the Canyon walls but the trail is too busy for bears and the canyon is a real obstacle for them to move through the valley. Having said that, it is recommended to carry bear spray on any hike in the mountain parks and avoid wearing earbuds or headphones. 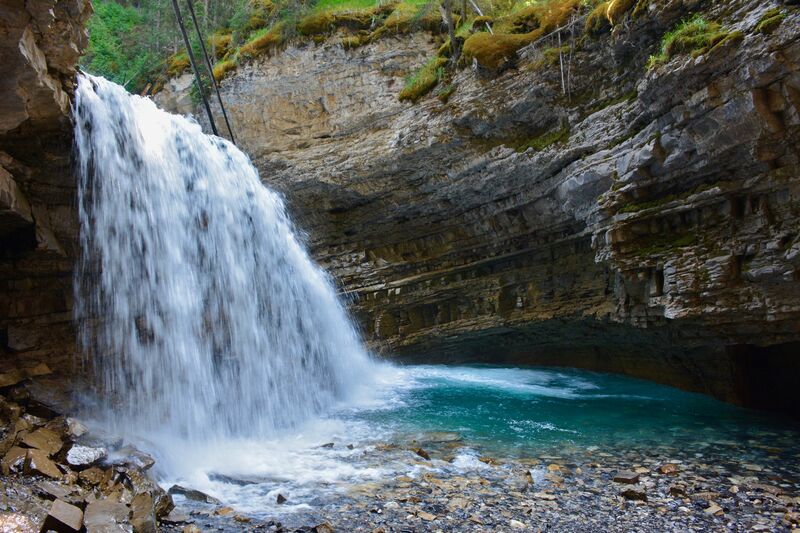 Best time of the year to see Johnston Canyon and the waterfalls? Each season dramatically changes the Canyon’s character so that is a very subjective question. Spring: May / June. Daylight from 6 am – 10:30 pm. Most dramatic. Water level reaches peak in mid June from the winter snow melt run off and roar and force of the water is intimidatingly fast and powerful. Deadfall and even large trees can be seen being swept over the falls and down the canyon floor. The water appears very aggressively turbulent; a cloudy mix of glacial till and melt water with thundering roar deafening at certain locations. Summer: July – September. Daylight 6 am – 9 pm. Most like a postcard. The actual waterfalls are at the peak of beauty and colour as the muddy run off has subsided and the emerald green waterfall pools contrast against the pure white roaring cascades. Moss and poplar trees radiate fresh forest smells and greenery. However, the trail is at its busiest peak for traffic – early morning or early evening times are best to explore. Fall: October / November. Daylight 8 am – 6 pm. Most relaxed. October bursts with fall colours and the water levels are at their lowest of the year so the waterfalls are greatly subdued. The creek however reveals more as rapids have eased and you can clearly see the limestone creek basin. Huge glacial river rocks rest at the bottom of Johnston Creek which are all polished perfectly showcasing unique colour combinations and geological composition. Very low traffic volumes.